TLJ Daily E-Mail Alert No. 2,380, April 25, 2012. Wednesday, April 25, 2012, Alert No. 2,380. 4/26. The House amended and passed HR 3523 [LOC | WW], the "Cyber Intelligence Sharing and Protection Act of 2011" or "CISPA", a bill that would incent cyber threat information sharing, and surveillance. The vote on final passage was 248-168. See, Roll Call No. 192. Rep. Mike Rogers (R-MI), lead sponsor of the bill, and Chairman of the House Intelligence Committee (HIC), stated that "We can’t stand by and do nothing as U.S. companies are hemorrhaging from the cyber looting coming from nation states like China and Russia. ... America will be a little safer and our economy better protected from foreign cyber predators with this legislation." See, HIC release. Rep. Jim Langevin (D-RI), a member of the HIC, voted for the bill. He stated that this bill "will allow the government to provide classified information threat signatures to the private sector and also allow the private sector to share with us the cybersecurity attacks that they are experiencing, sharing that with the government so we have better situational awareness." He added that this "bill is a good step, but it's only a first step". He said that in addition legislation is needed that "establishes minimum standards for the cyber systems that govern our critical infrastructure, particularly the electric grid and our water systems". See, statement. Rep. John Dingell (D-MI), who voted against the bill, stated that it "grants private entities that share information with the government exemption from liability. The bill also permits the government to use information received from private entities for purposes other than preventing cyberattacks. I cannot vote in good conscience to grant the authorities H.R. 3523 would vest in the federal government for fear of undermining Americans’ cherished civil liberties, which I have defended for my entire career in Congress." See, release. Rep. Joe Barton (R-TX), who voted against the bill, read aloud the 4th Amendment of the Constitution on the House floor. See, video [You Tube]. He added that "The solution is worse than the problem they are trying to solve." Rep. Zoe Lofgren (D-CA), who voted against the bill, spoke about cyber security at a Washington conference hosted by the Computer and Communications Industry Association (CCIA) on April 26. She said that the bill provides a role for the National Security Agency (NSA) in civilian life. Rep. Jim Sensenbrenner (R-WI) also voted against the bill. He is a former Chairman of the House Judiciary Committee (HJC) who led House efforts to pass the USA PATRIOT Act in 2001, and then efforts to amend it extend its sunsetted provisions. The Center for Democracy and Technology (CDT) stated in a release that it "is disappointed that CISPA passed the House in such flawed form and under such a flawed process". It added that it is "disappointed that House leadership chose to block amendments on two core issues we had long identified -- the flow of information from the private sector directly to NSA and the use of that information for national security purposes unrelated to cybersecurity. Reps. Thompson, Schakowsky, and Lofgren wrote amendments to address those issues, but the leadership did not allow votes on those amendments. Such momentous issues deserved a vote of the full House. We intend to press these issues when the Senate takes up its cybersecurity legislation." Obama Administration. President Obama might veto this bill as passed by the House. The Executive Office of the President (EOP) released a "Statement of Administration Policy" or SAP on April 25 that states that "the Administration strongly opposes H.R. 3523, the Cyber Intelligence Sharing and Protection Act, in its current form", and "if H.R. 3523 were presented to the President, his senior advisors would recommend that he veto the bill". See, EOP statement and story titled "Obama EOP Opposes CISPA" in TLJ Daily E-Mail Alert No. 2,379, April 24, 2012. Daniel Weitzner of the EOP and NTIA spoke about cyber security at the CCIA conference on April 26. He said that "we don't want to see a militarization of cyber space". He advocated information sharing, but also said that liability limitations should not create "lawlessness", and that the bill should not "sacrifice privacy and civil liberties". Senate. The Senate has not yet passed this bill. Sen. Mark Warner (D-VA) also spoke about cyber security at the CCIA conference on April 26. He stated that legislation that addresses cyber security "only on a voluntary basis" worries him. He said that there should also be standards. Sen. Warner also warned that if there is a successful cyber attack on critical infrastructure in the US, "there would be an over reactive legislative response". Sen. Charles Grassley (R-IA) spoke about cyber security at the Senate Judiciary Committee's (SJC) executive business meeting on April 26. He referenced the EOP's SAP, and said that "One of the major reasons the statement was allegedly issued was that the bill ``fails to provide authorities to ensure that the Nation's core critical infrastructure is protected.´´ In other words, the President won't sign the bill into law because it doesn't give DHS the power to regulate the private sector." He continued that "I have been skeptical of giving DHS the power to regulate cybersecurity from the outset. But, I do believe the threat to our country from cyber-attacks is real. That is why I have cosponsored S.2151, the SECURE I.T. Act. This legislation will enhance cybersecurity without creating a new bureaucracy at DHS and without stifling innovation in the private sector with burdensome new regulations." See, S 2151 [LOC | WW] and Sen. Grassley's statement. He said that given the Department of Homeland Security's (DHS) failure to approve any chemical facility's site plan under the Chemical Facility Anti-terrorism Standards (CFATS), it should not be given regulatory authority with respect to cyber security standards. He said that "Based upon the failures of CFATS" and "Absent proof, and not just assurances, that the problems are fixed, we should not even consider giving DHS another ounce of regulatory authority or additional layers of bureaucracy to deal with Cybersecurity." Positive Reaction to CISPA Passage. Walter McCormack, head of the US Telecom, applauded passage of the CISPA. See, release. Robert Holleyman, head of the Business Software Alliance (BSA), stated in a release that this bill "is critical because it unties the hands of companies on the front lines of the digital economy. The bill will let IT professionals share important threat information with their peers in government and in the private sector who 'need to know' and 'need to act.'" Negative Reaction to CISPA Passage. The American Civil Liberties Union (ACLU) stated in a release that the CISPA "would allow companies to share private and sensitive information with the government without a warrant and without proper oversight. CISPA also gives companies the authority to share that information with the National Security Agency or other element of the Department of Defense." Matt Wood of the Free Press stated in a release that "CISPA is a dangerous piece of legislation and it’s worrisome that the House has passed such an overreaching bill. The bill still lacks effective oversight and accountability for companies and government agencies collecting massive amounts of our personal data. It would curtail Internet openness and freedom by stripping away crucial privacy protections, and without providing any guarantee of protection for critical infrastructure." The Electronic Frontier Foundation (EFF) stated in a release that the CISPA "would allow companies to bypass all existing privacy law to spy on communications and pass sensitive user data to the government. EFF condemns the vote in the House and vows to continue the fight in the Senate." The EFF's Rainey Reitman stated in this release that "We will not stand idly by as the basic freedoms to read and speak online without the shadow of government surveillance are endangered by such overbroad legislative proposals". 4/26. Rep. Cliff Stearns (R-FL) and Rep. Doris Matsui (D-CA) introduced HR 4817 [LOC | WW], the "Efficient Use of Government Spectrum Act", a bill that require that the Federal Communications Commission (FCC) to pair the 1755-1780 MHz block and the 2155-2180 MHz block, which is already set for auction, for reallocation and auction for commercial wireless use. The two issued releases that state that when the Congress enacted its spectrum bill in February, "at the last minute, the 1755-1780 spectrum block was pulled from the law". See, Rep. Stearns' release and Rep. Matsui's release. Then, on March 27, 2012, the National Telecommunications and Information Administration (NTIA) released its report [155 pages in PDF] titled "An Assessment of the Viability of Accommodating Wireless Broadband in the 1755 - 1850 MHz Band". The NTIA report also states that compared to the reallocation of the 1710-1755 MHz band, "the 1755-1850 MHz band presents significantly greater challenges". See also, story titled "NTIA Releases Report on 1755-1850 MHz Band" in TLJ Daily E-Mail Alert No. 2,358, March 27, 2012. Rep. Matsui (at right) stated in her release that "We are faced with a spectrum crunch in our country and consumers continue to demand the latest smartphones and devices, which will only increase demand." She said that "This bipartisan legislation moves us a step closer to bringing an additional 25MHz of federal spectrum to auction for commercial wireless services. This bill also seeks to provide the necessary and responsible safeguards for DoD and other federal agencies to relocate, if necessary, by following the recommendations set forth in the March 2012 NTIA Report." In addition, "the proceeds from the auction will go either toward building out our nation’s public safety interoperability network, or to the U.S. Treasury." Jot Carpenter of the CTIA stated in a release that "Reallocation of the 1755 to 1780 megahertz band is a high priority for CTIA and its members and so we welcome introduction of the Stearns-Matsui bill. We hope that this and other bands currently occupied but often underutilized by federal users will be made available for commercial use as expeditiously as possible. Freeing spectrum like the 1755 to 1780 megahertz band is key to helping ensure that the U.S. remains the world’s leader in the deployment of wireless broadband services." The House will meet at 9:00 AM for legislative business. It will consider under suspension of the rules HR 2096 [LOC | WW], the "Cybersecurity Enhancement Act of 2011", HR 3834 [LOC | WW], the "Advancing America's Networking and Information Technology Research and Development Act of 2012". See, Rep. Cantor's schedule. The Senate will not meet. It will next meet on May 7, 2012. It will resume consideration of the motion to proceed to S 2343 [LOC | WW], the "Stop the Student Loan Interest Rate Hike Act". 9:15 AM. The House Judiciary Committee's (HJC) Subcommittee on Immigration Policy and Enforcement will on another hearing on the E-Verify program. It also held a hearing on February 10 and a hearing on April 18. This one is titled "E-Verify: The Perspective of Employers Who Use It". See, notice. See also, story titled "Rep. Lamar Smith Seeks Passage of E-Verify Bill" in TLJ Daily E-Mail Alert No. 2,337, February 15, 2012. Location: Room 2141, Rayburn Building. TIME CHANGE. 10:00 AM. The Federal Communications Commission (FCC) will hold an event titled "Open Meeting". See, agenda, and story titled "FCC Releases Tentative Agenda for Meeting of April 27" in TLJ Daily E-Mail Alert No. 2,369, April 12, 2012. Location: FCC headquarters, Room TW-C305, 445 12th St., SW.
12:00 NOON - 1:30 PM. The American Bar Association's (ABA) Section of Antitrust Law will host a teleconferenced panel discussion titled "High Tech: Strategic Conduct, Patents and Industry Standards". The speakers will be Roy Hoffinger (Qualcomm), Gail Levine (Verizon Communications), Patrick Roach (Federal Trade Commission), and Sean Gates (Morrison & Foerster). Free. No CLE credits. See, notice and registration page. 12:30 - 2:00 PM. The American Bar Association's (ABA) Section of Antitrust Law will host a teleconferenced panel discussion titled "Twombly, Iqbal and the State Courts: a Resurgence of Notice Pleading?". See, Supreme Court's 2007 opinion in Bell Atlantic v. Twombly, 550 U.S. 544, and story titled "Supreme Court Rules in Bell Atlantic v. Twombly" in TLJ Daily E-Mail Alert No. 1,585, May 22, 2007. The speakers will be Mel Schwarz (Marsh & McLennan Companies), Barbara Sicalides (Pepper Hamilton), Ned Cavanagh (St. John's University Law School), Barry Barnett (Susman Godfrey), and Geoff Holtz (Bingham McCutchen). Free. No. CLE credits. See, notice and registration page. 9:30 AM. The Department of Commerce's (DOC) Bureau of Industry and Security's (BIS) Sensors and Instrumentation Technical Advisory Committee (SITAC) will meet. See, notice in the Federal Register Vol. 77, No. 75, Wednesday, April 18, 2012, at Page 23222. Location: DOC, Hoover Building, Room 3884, 14th Street between Constitution and Pennsylvania Avenues, NW. 1:00 - 2:00 PM. The law firm of Fulbright & Jaworski will host a webcast seminar titled "International E-Discovery: When Cyber Workspaces Collide with U.S. Litigation". CLE credits. See, notice and registration page. 1:00 - 2:00 PM. American Bar Association's (ABA) Section of Antitrust Law will host a teleconferenced panel discussion titled "Privacy and Information Security Update". The speakers will be Benita Kahn (Vorys Sater Seymour & Pease), Reed Freeman (Morrison Foerster), Julie O’Neill (MoFo), and Nicholas Datlowe (MoFo). Free. No CLE credits. See, notice. Register by sending an e-mail to Jeanne Welch at jawelch at vorys dot com. 6:00 - 9:00 PM. The DC Bar Association will host a presentation titled "Antitrust Basics for Non-Antitrust Lawyers". The speakers will be William Kovacic (George Washington University), Michael Brockmeyer (Frommer Lawrence & Haug), Robert Hauberg (Baker Donelson), and Grace Kwon (Dewey & LeBoeuf). Free. No CLE credits. No registration required. Reporters are barred from attending most DC Bar events. See, notice. For more information, call 202-626-3463. Location: DC Bar Conference Center, 1101 K St., NW. Deadline to submit reply comments to the Federal Communications Commission (FCC) in response to its Further Notice of Proposed Rulemaking (FNPRM) [339 pages in PDF] regarding it Lifeline and Link Up universal service tax and subsidy programs. The FCC adopted this FNPRM on January 31, 2012 and released the text on February 6, 2012. It is FCC 12-11 in WC Docket Nos. 11-42, 03-109, and 12-23, and CC Docket No. 96-45. See, notice in the Federal Register, Vol. 77, No. 42, Friday, March 2, 2012, at Pages 12784-12791. 12:30 - 2:00 PM. The American Intellectual Property Law Association (AIPLA) will host a webcast presentation titled "Patent Prosecution Under the AIA: Strategies For Before, During and After the Transition to First to File". The speakers will be Joseph Matal (Sen. Jon Kyl's Senate Judiciary Committee counsel) and Courtney Brinckerhoff (Foley & Lardner). CLE credits. CD, MP4 download, archived webcast, and other formats available. Prices vary. See, registration page. Deadline to submit reply comments to the Federal Communications Commission (FCC) in response to NextG Networks of California, Inc.'s December 21, 2011, Petition for Declaratory Ruling (part 1 and part 2) regarding whether it is a "commercial mobile radio service" or "CMRS" within the meaning of the FCC's rules. See, FCC's Wireless Telecommunications Bureau's (WTB) February 16, 2012 Public Notice (DA 12-202 in WT Docket No. 12-37). See also, notice in the Federal Register, Vol. 77, No. 39, Tuesday, February 28, 2012, at Pages 12055-12056. And see, NextG Networks web site. 9:00 AM - 12:00 NOON. The Net Caucus will host an event titled "State of the Mobile Net Conference". At 9:00 AM there will be a panel titled "Complex Devices / Complex Privacy Questions: Grappling With Privacy In the Mobile Space". At 10:15 AM, Jason Weinstein, Deputy Assistant Attorney General in the DOJ's Criminal Division will address "Location Tracking by the Government After Jones: What Jones Tells Us About Mobile Phone and App Tracking". At 10:45 AM - 12:00 NOON, there will be a panel titled "Megabytes by the Morsel and Data by the Dollop: How Will New Mobile Data Plans Affect Consumers, Innovation and the Mobile Marketplace?". See, notice. Location: Reserve Officers Association Building, 5th Floor, One Constitution Ave., NE. 12:15 - 1:45 PM. The Federal Communications Bar Association's (FCBA) International Telecommunications Committee will host a brown bag lunch titled "The WRC: A Look Back and A Look Forward". 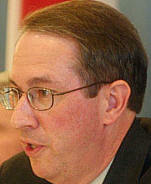 The speaker will be Decker Anstrom, head of the US delegation to the 2012 ITU World Radiocommunication Conference in Geneva, Switzerland on January 23 through February 17, 2012. For more information, contact Chris Murphy chris dot murphy at inmarsat dot com. Location: Wiley Rein, 1776 K St., NW. 1:00 - 2:00 PM. The American Bar Association's (ABA) State and Local IT Procurement Committee will meet by teleconference. The call in number is 1-888-684-4447. The passcode is 8504255612. Free. No CLE credits. See, notice. For more information, contact Karen Walker (Holland & Knight) at 850-425-5612 or karen dot walker at hklaw dot com. Deadline to submit reply comments to the Federal Communications Commission (FCC) in response to its Public Notice (PN) that seeks comment regarding whether to fund Rural Health Care Pilot Program participants who will exhaust funding allocated to them before or during funding year 2012 (July 1, 2012 - June 30, 2013). The FCC's Wireline Competition Bureau (WCB) released this PN on February 27, 2012. It is DA 12-273 in WC Docket No 02-60. See, notice in the Federal Register, Vol. 77, No. 47, Friday, March 9, 2012, at Pages 14364-14366. 1:00 - 4:00 PM. The Department of State's (DOS) State Advisory Committee on Private International Law's (ACPIL) Online Dispute Resolution Study Group will meet to discuss the next session of the United Nations Commission on International Trade Law (also know as UNCITRAL) ODR Working Group, scheduled for May 21 through May 25, 2012, in New York City. The DOS states that the UN working group is "developing generic ODR procedural rules for resolution of cross-border electronic commerce disputes", among other things. See, notice in the Federal Register, Vol. 77, No. 75, Wednesday, April 18, 2012, at Pages 23318-23319. Location: DOS, Truman Building, Room 6320, 2201 C St., NW. Deadline to submit nominations for co-chairmen of the Federal Communications Bar Association's (FCBA) Young Lawyers Committee. Send nominations to Mark Brennan at mark dot brennan at hoganlovells dot com and Brendan Carr BCarr at wileyrein dot com. The election will be held on May 14. 4/23. The Public Knowledge (PK) released a vaguely argued paper titled "Know Your Limits: Considering the Role of Data Caps and Usage Based Billing in Internet Access Service". The paper praises flat rate price plans for broadband internet access service (BIAS), and criticizes both usage based pricing (UBP) plans and data caps on flat rate plans. Also on April 23, the PK sent letters to BIAS providers AT&T, AT&T Mobility, Comcast, Cox, Sprint, T-Mobile, Time Warner Cable, Verizon, and Verizon Wireless that propounds numerous interrogatories regarding usage based pricing plans and data caps on flat rate plans. The PK paper argues that BIAS providers must disclose, explain, and justify their pricing. Moreover, this must be subject to monitoring and oversight by regulators. However, the paper avoids use of the phrase "FCC price regulation". Randall May, head of the Free State Foundation, and a former FCC Associate General Counsel, stated in a release that the PK is ultimately calling for "rate regulation for Internet providers. While Public Knowledge doesn't put the matter so bluntly, or transparently, when it calls for government ``oversight´´ of usage-based pricing, it acknowledges the government, of necessity, would examine factors such as the cost justification for different pricing structures, the costs of additional network investments, the relation of various prices to additional increments of usage, the relation of prices to usage during different periods during the day, and the like." The PK paper does not suggest a costs plus reasonable rate of return method of price regulation. Rather, the PK suggests oversight of the method of pricing BIAS. The PK paper states that BIAS providers must disclose the "underlying justifications for the pricing structures" and "must explain what goals UBP is designed to achieve". It states that ""regulators must vigilantly monitor UBP schemes to ensure that service providers do not leverage market power to increase costs and suppress demand for competing services delivered over IP." It adds that "regulatory oversight is critical to maintaining a competitive landscape for services delivered over IP". Also, on April 23, 2012, the PK, FP, New America Foundation (NAF), and Consumers Union (CU) sent a letter to the Senate Commerce Committee (SCC) in which they criticized "economically unjustified limitations and restrictions on data usage imposed by certain broadband Internet access providers" and asked the SCC to "take a closer look at the justification for data caps". The SCC held a hearing on April 24 titled "The Emergence of Online Video: Is It The Future? ".